Contacts, Are They Right For You? You eyesight is valuable to you and with the proper vision care you can enjoy healthy eyesight your whole life. Regular eye exams are the foundation for excellent vision and at Kiyan Optometric we work with your busy schedule to obtain an appointment time that works for you. Fittings for glasses or contacts can be fun and creative. A new pair of eye glasses can give you a brand new appearance and with contacts even a brand new color to brighten up your smile. Preventative care for the health of your eyes is a very important part of your eye care and can be incorporated into your vision appointments. Our skilled professionals have years of experience to offer and are able to detect eye conditions that may have otherwise gone undiagnosed. Healthy eyes are the cornerstone of clear vision. We will thoroughly evaluate your eyes for potential eye disorders and diseases such as glaucoma, cataracts, macular degeneration etc. as well as carefully assess your visual skills and binocular ability to make sure that you have comfortable, crisp vision. If this is your first time to our office you may choose to have an Eye Screen retinal photograph. The retina is a very sensitive tissue that can be affected by certain eye disorders, degenerations or diseases. Allow us to more completely evaluate the health of your eyes and potentially detect and diagnose potential sight threatening conditions earlier. Glaucoma, cataracts, diabetic retinopathy, and macular degeneration are the four most common eye diseases that cause vision loss. To find out more about these sight stealing diseases click here. We are trained to diagnose and treat a wide variety of eye diseases. 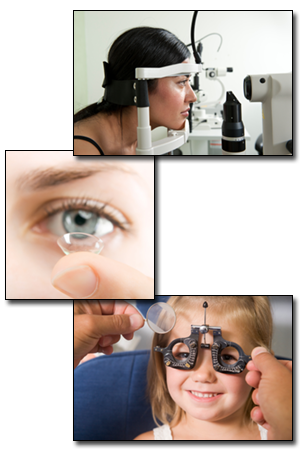 We are experts in fitting all types of contact lenses including bifocal, astigmatism, keratoconus, dry eyes etc. Visit our Contact Lens Service pages for more information on contact lenses. Quality vision eyewear and precision optical lenses.